While the surgeon may have disparaged visions in patients, they’re necessary for growing tomatoes. Visions of eating home-grown tomatoes help sustain tomato growers during the trials and tribulations of la saison des tomates. Indeed, growing tomatoes for everyone is an actus fidei, to quote my friend, because various, maddening afflictions, such as blossom end rot, white flies, and the wilts, arrive unannounced. Especially sad are the blossom end rots which arrive later in the season just as the plants are on the cusp of fruition. First off, several precautions can be taken to avoid various types of late season malaise. Tomatoes are best planted several feet apart in sterilized soil. Drowning them in too much water increases the likelihood of an affliction. No fools, tomatoes don’t like to stand in water and need good drainage. They also like a rich, friable soil. Using containers makes it easier to cleanse the soil and control watering and fertilizing. Soil can be sterilized by putting it in a black plastic container, covered with a black plastic refuse bag, for ten days. 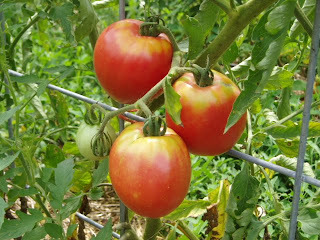 Flagstaff’s relatively short growing season, averaging a hundred and three days, requires tomatoes which produce early. The average last frost (32º) is June 10 and last freeze (28º) is May 28, and the average first frost is September 21 and freeze October 6. Of course, the best thing is to check with the National Weather Service at www.wrh.noaa.gov/fgz/. Walls O’ Water, which are 18″ diameter fluted, plastic, mini-greenhouses, extend the growing season by protecting tomato plants down to 16º. Seedlings can be planted outside 6-8 before the last frost and may produce fruit 30-40 days earlier than otherwise. For more information its website is www.wall-o-water.com. An alternative is circling a tomato plant with 7 two-liter plastic bottles filled with water, remembering to leave no air space between the bottles. In any case, remember to warm the soil a few days before transplanting. If buying tomato seedlings at a commercial nursery, Early Girl (59 days to maturity) and Better Boy (70 days) are often the favored. Be sure to check the plant for any signs of unwanted insects, such as white fly. If starting from seed, many varieties are possible, especially Canadian and Siberian tomatoes. Seeds for several varieties of these tomatoes can be ordered from seedstrust.com which specializes in tomatoes suitable for our climate. 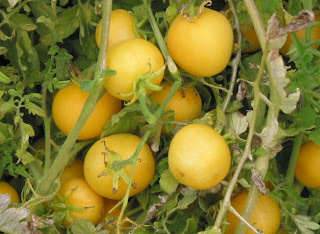 My favorite is the Galina (69 days), a golden Siberian cherry tomato of a sweetly complex taste. Also, the Canadian Prairie Fire )60 days) and the Siberian Sasha’s Altai (59 days) are early producers of good taste. There are many more from which to choose. Starting from seed isn’t a cinch, but it’s a pleasant chore. Commercial nurseries sell very small mini-greenhouses with translucent covers for sunny window sills with pods for the seeds. Plant the seeds about the last half of March and await the miracle of life as the seeds sprout into little seedlings. When they develop true leaves, they can be transplanted into pint-sized containers and allowed to grow into small plants. Along about the middle of May, the small plants can transplanted outside protected by Walls O’ Water. Special containers can be purchased for a fancy price, or five gallon black containers can be used just as well. The soil should be kept moist but not wet, and a fertilizer of 5-10-10 should be sprinkled regularly throughout the growing season. Too much nitrogen will produce a lovely plant with few tomatoes. Remember the vision: eating a warm tomato, freshly picked, at the vine, bending over so that the juice can drip off the chin. Keep the faith.